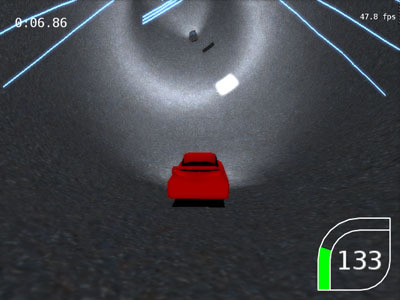 Tunnelrace is a rather unusual racing game. The environment is a round tunnel with no global gravity. The vehicles attach themselves to the walls with a levitation engine. There are also deadly electrical rays in the tunnel which must be avoided. This game placed as 5th out of 9 in Assembly 2005 game development competition. Notes: The AI is kinda stupid and does not really provide a challenge. There is no license information in the package, but consider it to be GPL. The source code is a bit of a mess and will be provided upon request.